Is This Callus or a Wart? Let me first say that if you have anything new on the bottom of your foot that pops up go see your podiatrist immediately. 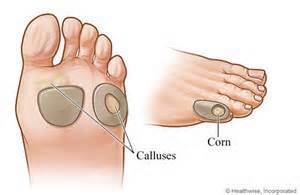 Calluses can be caused by pressure but they can also be caused by foreign bodies like splinters that can lead to infection. Furthermore, it is difficult to differentiate and callous from a wart, which unfortunately are contagious. So What is a Wart? 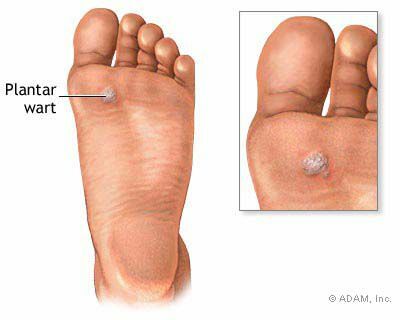 Plantar warts are caused by the human papillomavirus (HPV). The virus enters your body through tiny cuts, breaks or other weak spots on the bottom of your feet. Warts are non-cancerous growths, however they often cause pain and discomfort. Furthermore, ignoring warts and hoping they will go away is not an option. Warts multiple and grow larger when not treated. As mentioned, warts are very contagious. They can easily be transmitted from one person to another by coming into direct contact with a wart or with something – such as a locker room floor or a towel – that has been in contact with a wart. Which brings me to one last important point, because warts are contagious, make sure you check the feet of the individuals you share a shower with, more than likely they may have warts as well! If you think you may have a wart seek treatment immediately. The faster you seek treatment the easier it is to manage this condition.